2007 Ford Explorer Eddie Bauer 4X4.... Clean Title! When you purchase a vehicle with the CARFAX Buyback Guarantee, you're getting what you paid for. With this exceptional SUV, you'll get "sport," "utility," and comfort. Handle any terrain with ease thanks to this grippy 4WD. Whether you're on a slick pavement or exploring the back country, you'll be able to do it with confidence. In addition to being well-cared for, this Ford Explorer has very low mileage making it a rare find. 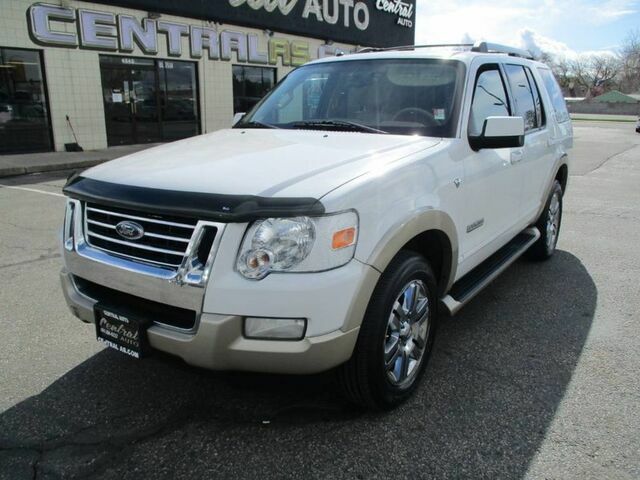 More information about the 2007 Ford Explorer: The 2007 Explorer is a traditional body-on-frame SUV, which makes it attractive to buyers in the market for a mid-sized SUV with towing and off-road capability. Safety equipment, including standard stability control with a rollover sensor, will appeal to the family haulers. Another plus for those with large broods is the availability of manual- or power-folding third-row seating. Base prices on all trim levels are down from 2006, including the high-end 4WD Limited V8, which has more standard equipment than the 2006 version. This model sets itself apart with Generous standard safety equipment, quiet cabin, and good balance of around-town driving, towing, and off-road capabilities.